Blackbird, a resolutely masculine American boutique, always draws its inspiration from art, nature and the unknown. Yes, the unknown! This company lets itself by guided by its intuition, by the things that catch its “eye”. That is how Tar Field Notes came about. Initially designed to be used by Blackbird staff, the team loved it so much that it had to make it available to the public. It just had that wow factor. This notebook is three in one. Its pages are not lined or gridded. Instead, they are filled with small, pale gray dots, giving your imagination free reign. What makes Tar Field Notes truly one-of-a-kind is its look. Its 144 pages are hand-bound with a tar-based formula. 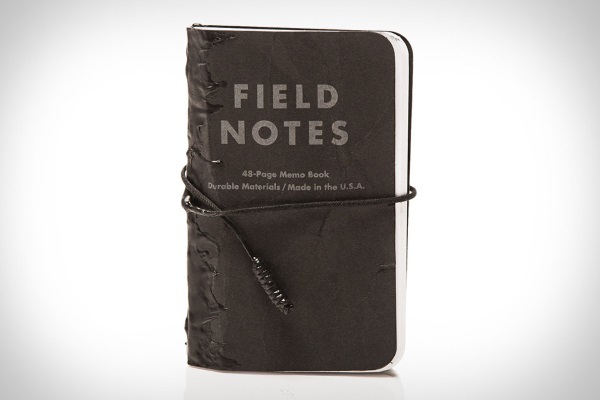 A double-wrapped, tarred cord holds the notebook closed and a little tarred cord acts as a bookmark. Tar Field Notes can be purchased for $28 USD each.